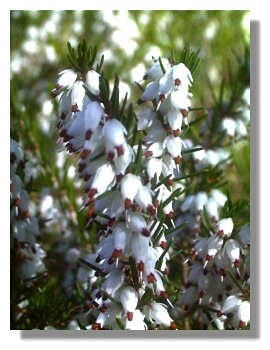 Heather is a wonderful garden plant. There are varieties which flower at all months of the year, the plants are evergreen (or have colourful foliage) and in the right conditions (such as the damp acid soil of Scotland) will grow with little attention apart from some light pruning in the spring. And they produce a profusion of flowers each year. What more could a gardener ask for? Here's a large selection of graphics showing this versatile plant in many different guises. Just click on the thumbnails below and see why it is such a popular plant. There is a link from each graphic to the next if you would like to view them all.